If you don't have the time to make a homemade fruitcake this year, consider this semi-homemade fruitcake recipe. 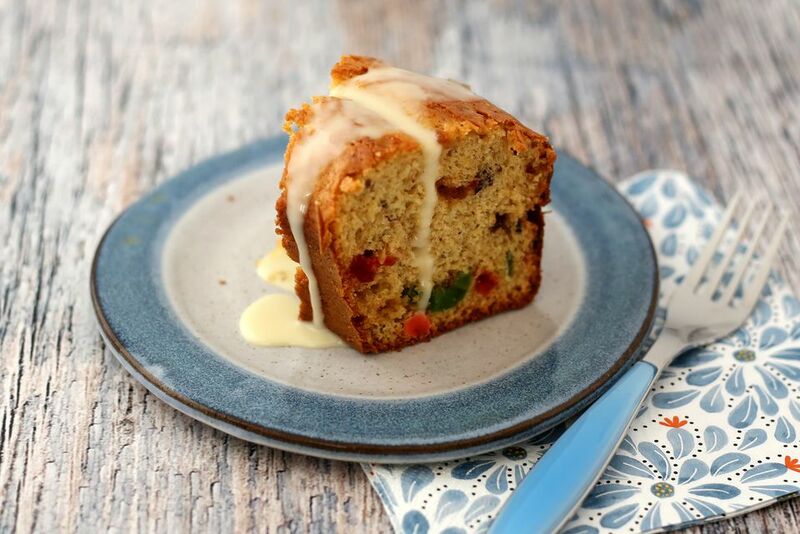 A spice cake mix makes it a quicker preparation than a classic fruitcake while the addition of apricot brandy and chopped candied fruits give it all the flavor you would expect from a holiday fruitcake. Apricot nectar and apricot brandy are used to flavor the cake, and a variety of dried and candied fruits make it a moist and attractive holiday cake. A yellow cake mix was used to make the pictured fruitcake, along with a blend of spices (see the tips, below). The cake is versatile as well. Use pecans instead of walnuts, if that's what you have. Feel free to add 1/2 to 1 cup of raisins or dried cranberries to the cake along with the dates, or replace them with another kind of dried fruit. For more color, add 1/2 cup of green candied cherries along with the red. If you prefer to bake without the apricot brandy, go ahead and replace it with more apricot nectar. Or add some orange juice to the cake and glaze instead of apricot brandy. Drizzle the glaze over the cake just before serving. Generously grease and flour a one piece 10-inch tube cake pan. In a large mixing bowl with an electric mixer, combine the cake mix, pudding mix, apricot nectar, 1/4 cup apricot brandy, and vegetable oil. Beat on medium speed until batter is smooth, about 2 minutes. Add the eggs to the batter one at a time, beating thoroughly after each addition. Fold in the chopped fruits and nuts. Turn the batter into the prepared tube pan. Bake in the preheated oven for 50 to 55 minutes, or until the cake tests done. Cool for 15 minutes in the pan and then remove the cake to a rack to cool thoroughly. For best flavor, wrap and store the cake in the refrigerator for 24 hours before serving. Combine 2 to 3 tablespoons of apricot brandy with 1 cup confectioners' sugar; drizzle over fruitcake before serving, if desired. If you don't have a spice cake mix in your pantry, you can make it with a yellow, white, butter pecan, or butter cake mix. To the yellow or another cake mix, add the following spices: 2 teaspoons of cinnamon, 1 teaspoon ground ginger, 1/2 teaspoon ground nutmeg, 1/2 teaspoon ground allspice, and 1/4 teaspoon of ground cloves.